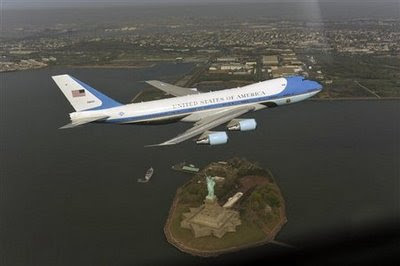 A volcano of sorts erupted last week over a PR photo shoot of Air Force One overflying the Statue of Liberty. Someone at the Obama White House thought that would be a good photo opportunity. It turned out a little too good, with the low flying plane and two military fighter escorts causing a good deal of angst in lower Manhattan. New Yorkers bemoaned the painful memories of 9/11. The press erupted. The ritual handwringing has been conducted. The press demanded to know the cost of the photo shoot. The Air Force says the photo shoot cost taxpayers $328,835. I never trust official estimates of this sort. Another estimate puts the cost of the extra fuel at only $35,000. And all for what I have to say is not a very good picture. Is that New Jersey in the background? Maybe there are more pictures to process and develop over the next two weeks. I want to see the one from the angle backdropping the Manhattan skyline and ground zero. Air Force One taking off from Bakersfield, California. Air Force One overflying the coastline. Air Force One overflying Mount Rushmore. The new hybrid flexible fuel Air Force One, introduced on April 1, 2008. 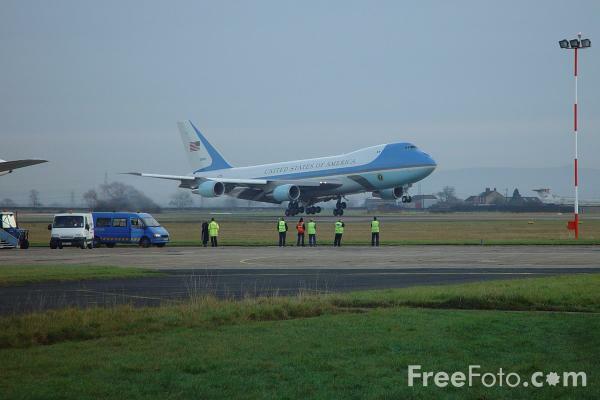 Air Force One moving down the runway. With 2 trucks and six guys in the shot, I put the official cost estimate at $100,000. Air Force One parked on the tarmac. No extra fuel costs for this.